Awesome!!!! Well,I do agree that quality looks a bit poor but hey,at least they let you post stuff here. What exactly is occurring in the mid left panel? 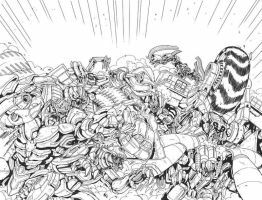 Also, If I am reading this correctly, this is alot of Autobots being crushed by Decepticons? Terrible and great. dude... i love your colors!!!!!!!!!!!!!!! Is the orange and green guys Mudflap and Skids? I think so! If it is, Roche deserves a big collective kiss from the fandom.